Seven days ought to be enough time for a lot of people to cycle through each stage of grief at least once, maybe twice. 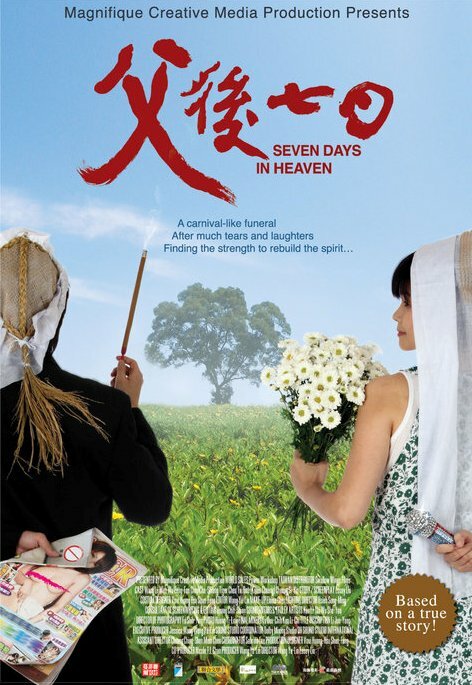 Understandably, scrupulously observing the traditional Taoist seven days of ritualized mourning takes a toll on Mei and her brother in Wang Yu-lin and Essay Liu’s Seven Days in Heaven (trailer here), which screens this weekend as part of the San Francisco Film Society’s Taiwan Film Days at the Viz Theater. Unlike her street vendor father, Mei left for the big city to make something of herself. Yet, theirs was always a loving relationship, as we come to understand through flashbacks. The good news is a distant relation who also happens to be a priest will oversee the arrangements to ensure everything is done properly. In a way, this is bad news as well. At least his partner, corporate entertainer and professional griever Chin has a knack for shaking down the local political wheels for more tangible expressions of condolence. Still, the round-the-clock program of sacraments drives Mei and her decidedly unmotivated brother to near exhaustion. Though not as emotionally devastating as Yojiro Takita’s Academy Award winning Departures, Heaven is still a rather complex and insightful examination of the grieving process. It might even be educational for some Yankee audiences, introducing them to customs like the burning of spirit money. While not every character of the large ensemble is as sharply drawn, it is anchored by a highly sympathetic, identifiably realistic protagonist, the more-or-less dutiful daughter Mei. Indeed, Wang Li-wen (best known as a producer) is quite remarkable in Heaven, really lowering the emotional boom in the film’s quietly powerful epilogue. She also has some lovely bittersweet father-and-daughter moments with veteran Taiwanese character actor Chang Chia-nien (a.k.a. Tai Bao) that Wang and Liu shrewdly never let get too saccharine. While the roles of her brother and cousin are a bit underwritten, Cheung Si-yin always brings a welcomed infusion of energy to the necessarily depressing proceedings as the dynamic Chin. Yes, the dramatic possibilities of funerals have often been explored cinematically, but Wang and Liu end Heaven in a place not often seen on film. Liu’s screenplay (based on her essay-story) has a few gentle laughs mixed in here and there, but the dramedy unquestionably leans more towards the dramatic. Definitely recommended for the honest humanity of its father-daughter relationship, Heaven screens this Saturday (10/23) and Sunday (10/24) as part of the SFFS’s Taiwan Film Days.